V-Braille is a novel way to haptically represent Braille characters on a standard mobile phone using the touch-screen and vibration. V-Braille may be suitable for deaf-blind people who rely primarily on their tactile sense. A preliminary study with deaf-blind Braille users found that, with minimal training, V-Braille can be used to read individual characters and sentences. Keywords: - Blind, touch screen, Braille keyboard, android, text to speech. The WHO (World Health Organization) statistics about the blind shows that 285 million people are estimated to be visually impaired worldwide of that 39 million are blind and 246 have low vision. The visually challenged people are more sensitive to touch at the fingertip when compared to the normal individuals as they have the good sensation at their fingertip. Many methods have been shelved due to the lack of accessibility on accompanying hardware.The half of global mobile phone users will have a smart phone by the end of 2018 and sending messages have become a dominant way of connectivity between those people so it is necessary to have a smart phone application to the blind people. In this project, we have introduced a text to speech android application which can be easily installed in the existing android devices.Text to speech allows the user to identify the written letters, words and to facilitate error detection and editing.The keyboard used here does not require any extra hardware equipment to enable interaction with Android device. The main objective of this application is to provide an effective way of communication by eliminating the elaborated search for a specific object location on touch screen and switching between layers. The main aim of the project is to enable blind and visually impaired people to send a text and make calls in multi-touch screen mobile phones using the Braille language. The aim is identifying the difficulties with multi-touch screen mobile phones text entry for blind and visually impaired people, designing some interface layouts to input Braille cells in a multi-touch screen phone and to make device accessible and useful for blind people for all the basic purposes like message and calls. V-Braille is a simple mechanism forconveying Braille using the touchscreen and vibration on a mainstream phone. The system is programmed using Android Studio, which is software provided by Google for Application development. In the call module, the user enters the number or contact name using braille keyboard. The system checks the availability of that particular number or contact in phone database and makes calls. In the message module, the user enters the contact details and types the messages to be sent to the destination. The dictionary module is same as message module, but the only difference is instead of typing certain messages, we will have set of default messages which are predefined. Braille language is a tactical system of readingand writing used by blind people. In this system,the raised dots and bumps represent thecharacters where the blind people identify thesecharacters by use their fingertips. Braille cellcompose with six dots in two columns as three dots organized each column. The dots are numbered in a systematicorder wherein the first column has one, two, threedots and second column has four, five, six dots.The first column has one, two, three dots andsecond column has four, five, six dots. Charactersare denoted by combination of these six dots. The representation of numbers 0-9 has the same representation as first ten alphabets e.g. alphabet „a‟ represents number „1‟, alphabet „b‟ represents „2‟ and alphabet „j‟ represents „0‟ etc. We have also used the same method of representing letters and numbers in our Braille application. In addition to that, our application is also having the feature of Text to Speech which produces the audio corresponding to the character typed by the blind user. Thus, the blind user can be conscious about the text may require to type. This application has three modules such as dictionary, message and call. Dictionary module consists of set of default messages which can be sent in case of urgency. In the Dictionary, six messages are stored in the six available blocks and the blind people can send these messages using the Braille number keypad. Message module is used for sending the messages and Call module is used make a call. Braille keypad is integrated in all of the above three modules. This application is mainly based on the Braille language with two columns and three rows. The general method used by blind people is to read and write the dots from left to right. Each dot is activated individually by single tap on keyboard. For example if user taps the first dot in the keyboard it represents the alphabet „a‟ and the software read outs the alphabet to make sure about the letter has taped. After short interval of screen will get refresh then user can tap the next letter. After the completion of typing required text blind person can send the message to the intended person by doing long press on send button which is present in the bottom of the screen. Next it will move to the screen layout with Braille number keypad. 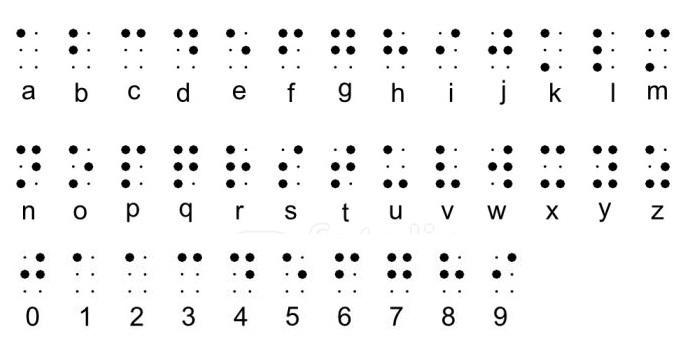 Here, the blind people can type the contact number of the intended person and send the message.For example user taps one tap on the left dot it will represents letter „a‟, if user taps two taps one below other it represents letter „b‟ so it represents user activated first dots in the Braille keyboard. If user stops taping the dots for short interval of time then our algorithm will taps the letter on the text box and read outs the letter. The main advantage is it will analyze the relationship between the dots and interprets the character; application uses the text to speech after a short interval to confirm the intended letter has been taped or not, error rate is significantly reduced by using this text to speech technique, this application is useful for both stationary people and those who are on the move. 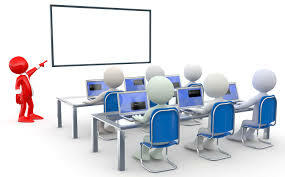 There are some typing operations such as space and back space which are not performed by Braille dots in the Braille keyboard because there are specific buttons on the Braille keyboard to perform those function, there are letters and numbers which are designed by analyzing the relationship between the dots, for example if the blind user types the single dot it will analyze the character and deeply it as character „a‟ or „1‟ based on the dot he has pressed. The VBraille application contains mainly three modules as shown in figure 3 i.e., Call, Message, Dictionary. User can select the option by clicking on the option. In figure 4, Call module provides braille keyboard to the user. User can enter the contact number using braille keyboard. After entering the contact number press “CALL” button in the bottom left corner of the screen. 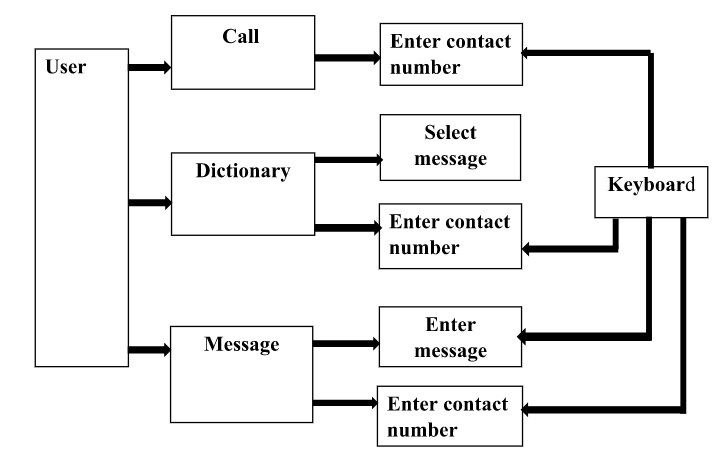 In figure 5, Message module allows user to type message of his interest. It will speak out the text which is typed by the user. The user can send the message by entering the contact number in the next page. In figure 6, Dictionary module provides six default messages. User can select the message by long pressing of particular button on the screen. The further enhancement can be done in the message module such as the messages can be made to receive through this application with the help of text-to-speech.Studies are being carried out to make the braille keypad more simple and user friendly. This project we have introduced an application that enables the blind people to enter the text and send message, and also enables user to make a call to concerned person more easily on touch screen devices by using touch screen and text to speech Braille keyboard, than with existing alternatives. Existing System requires hardware specifications to enable the communication over the mobile devices. 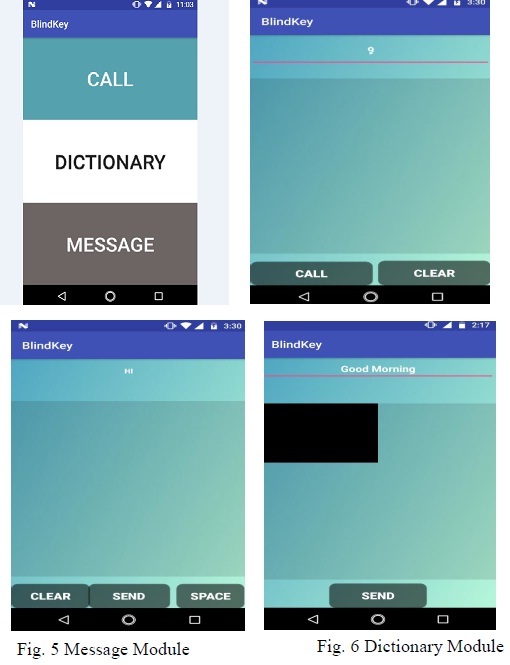 This application doesn‟t require any hardware specifications, it is easy to carry for the blind people to send message and make call by using Android mobile phone. 2] Stein, D. The Optacon: Past, Present, and Future. The Braille Monitor. Vol. 41, No. 5 May, 1998.